JBL never fails to impress it's consumers with its products, and the JBL E65BTNC is no different. With a very elegant design and availability in 3 colors, these headphones are not just eye candy. The fabric headband and angled, fitting ear cushions ensure that the listener can enjoy music comfortably for longer durations. 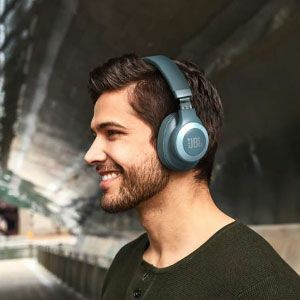 The active noise cancelling mode transports the listener to another world altogether, with the signature JBL sound. All this, with a battery life of 24 hours at a charging time of merely 2 hours (15 hours of battery life with Bluetooth and Active noise cancelling ON). 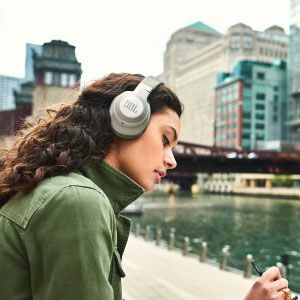 Now you can also manage many tasks at the same time with these headphones, by switching between two devices conveniently. Gone are the days when you had to remove your headphones after every few minutes because they were feeling too heavy or hurting the pinna. 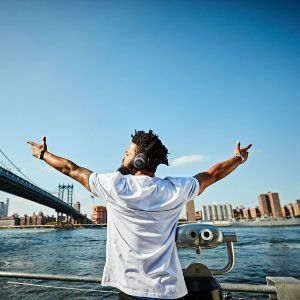 These headphones come with an ergonomic design, and a soft fabric, that lets you enjoy music for long. 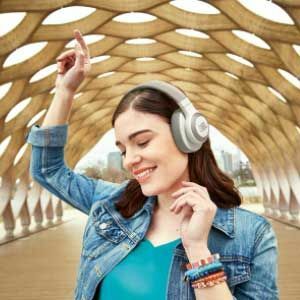 Headband is soft and comfortable and the ear cushions are angled and form fitting, so that you are comfortable while listening to your favorite songs. Enjoy listening to music all day? Then these are just the headphones for you. With a battery that will last you up to 24 hours with Bluetooth ON and ANC off, and even with both Bluetooth and ANC ON, a battery of 15 hours, never have a moment sans music in your life. All this, with a charging time of merely 2 hours. You don't have to worry about the ambient noise coming between you and your music. These JBL headphones come with noise cancelling feature. Now, enjoy unadulterated music all day , every day. The team of experts at JBL makes sure that they deliver nothing less than the signature sound. And it's nothing different with this product. The 40mm drivers give you the sound quality that JBL is famous for. Experience the magic of JBL sound. 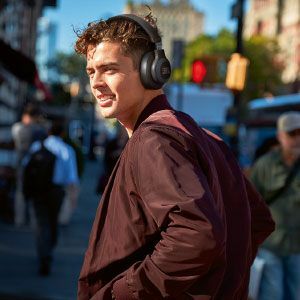 Instant and easy Bluetooth connectivity makes sure that you get to enjoy your music hassle-free. When you get a call, simply switch from the audio device to your smart phone such that no time is lost. Now multitask like a pro! Need Siri or Google assistant while listening to music? No worries. Simply tap on the power button on the ear cups and get your phone's voice assistant to do whatever it is that you want. Now get assistance at just the touch of a button. Limited time offer running on JBL E65BTNC. Get GST invoice and 1 year warranty in the box. Product will be dispatched within 24 hours of ordering. 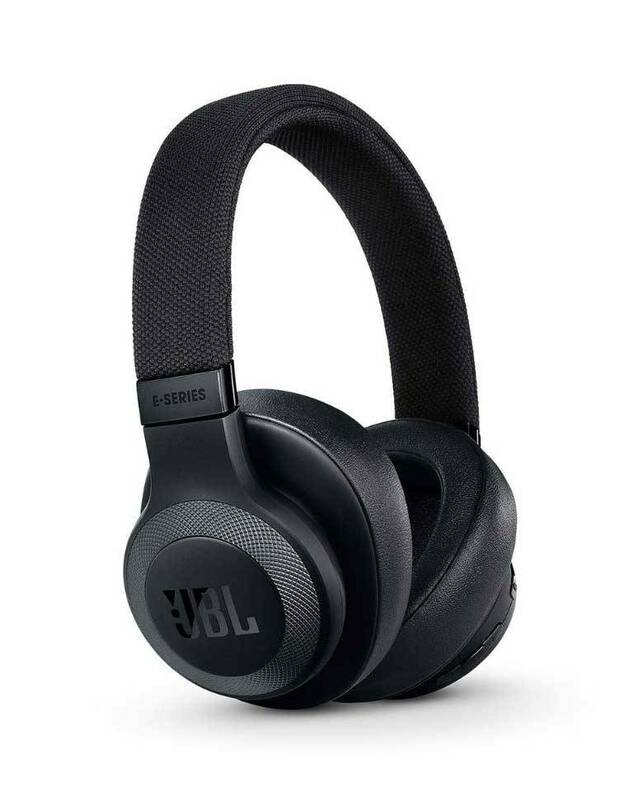 These jbl e65btnc headphones have a perfect noise cancellation environment. Is Useful on your way to work, or while in a trip. These make you feel every note, every beat of the music as if the song is being heard at the studio itself. I think buying tis device was a great Idea for me as these are just the best in this price point. The jbl e65btnc price in india is the lowest at vplak. 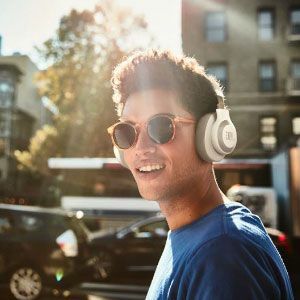 Most probably, These are the best Noise Canceling Wireless Headphones in the market available Right Now. The Bass is Awesome, and so is the noise clarity as well as the Wireless Connectivity. i m song lover and i liked sound quality of the headphone. thankyu so much,on time delivery with safe packaging. I have also used many sony products, overall i would say jbl e65btnc wireless is good if you have requirement of listening music as these have amazing sound clarity and nice bass. Q: Do these come with a warranty? A: Yes, these headphones come with a yearlong warranty offered by the manufacturer. Q: In how many colors are these headphones available? A: These headphones are available in 3 colors, namely, black, blue and white. Q: Does it also come with a detachable cable? A: Yes, it comes with a detachable cable in order to let you enjoy music even when the battery is low. Q: Can I use these with my OnePlus 6T phone? A: You can use these with any Android and iOS device that supports Bluetooth version v4.1 and higher, or a device with a 3.5mm audio jack. Q: How long is the detachable wire? A: The wire is 133.4 cm long. Q: What is the weight of the headphones? A: These headphones weigh 258g. Q: What is the impedance offered? A: The impedance is 32 ohm. Q: What is the sensitivity of these headphones?